Palace of Wind, the debut LP from New York City's Battle Trance, is unlike any record you'll hear this year. 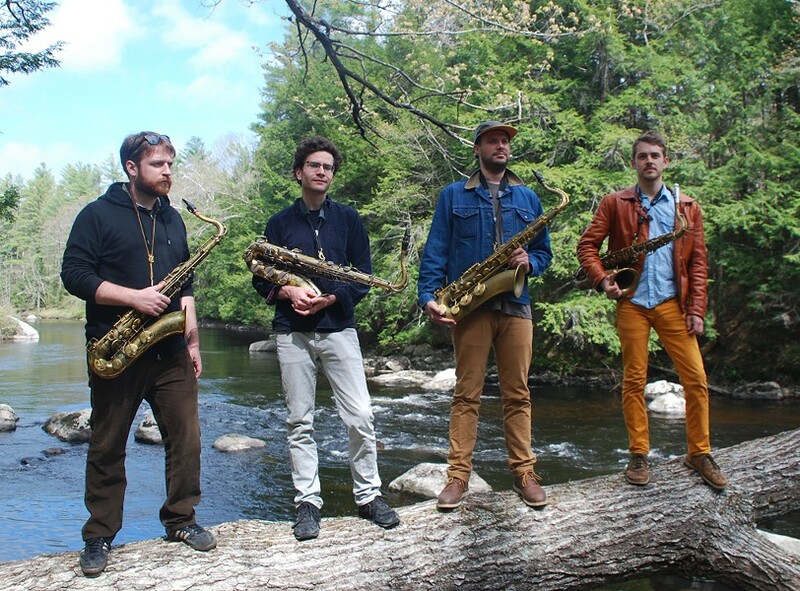 For one thing, it's almost certain to be the only album made by a band consisting solely of tenor saxophone players. Vermont native Travis Laplante, a member of the band Little Women and an accomplished jazz player, founded the quartet last year. He awoke one morning possessed by a vision of starting a band with fellow tenor saxophonists Matthew Nelson, Jeremy Viner and Patrick Breiner — even though he didn't actually know them. Once the four finally coalesced, they began rehearsing frequently and experimenting with circular breathing techniques and alternate fingerings. The result of that immersive sonic exploration is the band's debut, released jointly by New Amsterdam Records and Burlington's NNA Tapes. Palace of Wind is a single, album-length composition that pokes and prods the boundaries of experimental and avant-garde jazz. It's a sweeping, intricate work that is bracing and soothing in equal measures. At times it's difficult to parse, built around menacing drones and maniacally keyed phrases. At others, it's deeply serene, a contemplative, quietly beautiful elegy. The record is both technically fascinating and emotionally provocative. In advance of Battle Trance's tour kickoff and album-release show at Jenke Arts in Burlington this Tuesday, Seven Days spoke with Laplante by phone. SEVEN DAYS: Just how high were you when you came up with the idea for the band? TRAVIS LAPLANTE: [Laughs] I just woke up one day and had this very clear feeling that I had to start a band with these guys. It was slightly bizarre, because I didn't know any of them personally, at all. On top of that, I actually was unfamiliar with their music. It was a strange feeling, but it didn't go away. So I followed it and asked them if they wanted to start a band. That was it. SD: So no one balked at the idea of starting a band with total strangers? SD: Did you have a conceptual idea for the music when you started? TL: Not at all. I just knew I needed to start a band with these guys. At the first rehearsal we just sat and talked about what was important in music and life. And the music just formed out of the human relationships that started then. We started with simple exercises, holding a B-flat, which is the lowest note on the tenor saxophone, for maybe an hour, just feeling what it was like to be inside of a sound together. Then things started to roll from there. SD: How much of the album grew out of improvisation? TL: It's all composed and not improvised. However, it was predominantly transmitted orally, getting together and working out particular fingerings and material. SD: I spoke with [saxophonist] Colin Stetson a while ago and he said he has a grueling physical regimen that he does every day to keep himself in shape to be able to do things like circular breathing for extended periods. Do you guys have any similar regimens to stay in playing shape? TL: I think all of us do. Once you get into circular breathing or extended techniques in general, there is an aspect of becoming a slave to your instrument. You have to keep up particular muscles in your face you didn't even know were there before. If you don't, you can't sustain circular breathing. So it has to be practiced, or else your body won't hold up. It's quite demanding and takes a lot of endurance. SD: There was an interesting line in the press sheet your PR agent sent. It said that Battle Trance's music is not meant to "impress or entertain the listener." If not, what is it supposed to do? TL: That's a good one. That statement is in no way meant to alienate the audience. It's not one of those, "Oh, I do my art for myself and don't care what people think," kinds of statements. But it's difficult to talk about. I think this particular music can go beyond what people consider entertainment. Music, to me, is medicine. It can be healing. That can be hard to talk about, because when you say that, it evokes thoughts of, like, new-age music. But I feel music offers the potential for transformation, both for the performer and the listener. I know I've personally had my most meaningful experiences as a listener in settings that I wouldn't describe as entertaining at all. I've had experiences in music where I've literally cried for days after, because it was hitting something inside myself that nothing else could access until I heard that particular sound or piece and caused my heart to open more. This music does come from that place, the heart. So I'm less concerned with the audience coming away with something that's intellectually based. SD: When I was listening to the album, I found myself having to do two things to access and appreciate it. One was paying super-close attention and trying to break it down academically. The other was just turning my brain off and letting it have its way with my ears. TL: The most important thing in music to me is the heart connection. So I would hope you do the latter of those two things. Turn off the brain and just let the sound be. The original print version of this article was headlined "The Joy of Sax"